Depression affects how you think and act. It can cause serious problems in your ability to function, and affect your relationships, academic performance and life in general. People with depression can lose interest in their daily activities, even those things that they used to love. They can also be at risk for suicide. Depression can be genetic, meaning that it can run in families- although this does not mean that just because a family member has depression, you will automatically have it as well. Depression can be caused by chemical imbalances in the brain, stress or hormonal issues or from social experiences- like previous traumatic events. Some cases of depression can even be caused by lack of exposure to sunlight. Depression is a serious issue. It is more than just being sad. 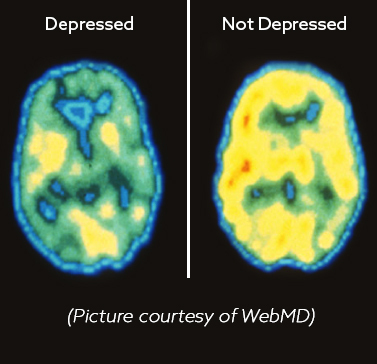 This picture shows the difference in activity levels in the brain of a person with depression versus the brain of a person who does not have depression. Depression is treatable and can be managed with a combination of coping skills, therapy and medication and medical treatment. Being depressed (sad, tearful, hopeless, empty inside) or irritable most of the day, almost every day. Loss of interest or enjoyment in most activities (even those that were once loved) on most days. Significant changes in weight (loss or gain), not sue to a diet or a major change (increase or decrease) in appetite. Changes in sleeping patterns- feeling tired/sleeping all the time, or not feeling tired/being unable to sleep. Changes in activity level- moving all the time (speeding up) or feeling unable to move (slowing down). Feelings of extreme guilt or worthlessness every day. Difficulty concentrating, extreme indecisiveness almost every day. Recurring thoughts of death, suicidal thoughts or actions, either with or without a plan. Feeling tired, hopeless, sad or worthless- constantly. Overreacting to situations or become extremely angry. Not taking care of yourself- not eating well, grooming or showering, or exercising the way you normally do, or not taking prescribed medication. Extreme changes in sleeping patterns. Sleeping all the time or feeling tired regardless of how much sleep you’ve gotten. Having difficulty sleeping or staying asleep. Difficulty concentrating or paying attention. Drop grades at school, not completing homework or assignments. Difficulty making decisions (even very small ones), or becoming indecisive. Withdrawing from friends or family. Not caring about things you used to really enjoy or not participating in the things you normally like- activities, hobbies or sports. Constantly feeling anxious, fidgeting or being impulsive- feel like you can’t sit still. Feeling as though you are too tired to move. Experiencing chronic physical pain, such as headaches or stomachaches that do not go away- even with medication. Hurting yourself or having thoughts about hurting yourself. Having persistent thoughts about death, feeling that the world would be a better place without you, feeling that you are a burden. Talk to someone as soon as possible. You do not have to handle this alone. Depression can be caused by an imbalance of chemicals in the brain- it is not the result of weakness or something that you can will simply yourself out of. You deserve support. If you are thinking of killing yourself, please contact 911 or your local authorities immediately or access the Help page of TeenCentral for a list of support hotlines. Although it might be tempting when you aren’t feeling good, try not to isolate yourself- you need a strong support network around you when you are struggling with depression. Feeling stressed or overwhelmed can be a trigger, so ask for help with the things that stress you out proactively when you need it! Sometimes you can be pulled into social media. Be careful, although this can be a useful distraction, too much when you are feeling depressed may actually make you feel worse. Exercise can be a natural mood elevator. Try going for a walk, a run or doing some yoga or breathing exercises. Continue to take care of yourself as much as possible. Your body requires proper nutrition and maintenance. Try to eat well, drink water and get restful sleep. Make a list of things that comfort you and use them when you aren’t feeling good. These can range from having a cup of tea to curling up in a blanket or watching your favorite movie. Stay away from things that can harm you. You might have the urge to make yourself feel better by using alcohol or drugs- these may seem like a temporary quick fix, but they will make things worse. Keep track of how you are feeling on a daily basis, so you can see if things are getting better, worse or staying the same. Tracking your moods can also help you to see trends and potential triggers. Check out TeenCentral’s Mood Tracker to keep up with how you are feeling! Encourage them to talk to you. It can be as simple as starting a conversation. Tell them you’re concerned because they are acting differently. Let them know it’s okay to talk about their feelings, and remember there is no need to have all the answers! Encourage them to get help from a trusted adult or professional. Help them to see the benefit in seeking out support. Share the things you’ve learned about depression, even offer to go along with them! Try to provide them with as much support as you are able. What your friend is going through can be scary- they may act strangely or do things that they normally wouldn’t, like withdraw from you. Try to remember what they are going through and support them as a friend as much as you can- but remember to take care of yourself too! Use your voice if you friend or loved one is suicidal. If you suspect that your friend may hurt themselves, it is time to say something to a trusted adult. Even if they say they’ll be upset with you, or you previously promised not to tell- now is the time to speak up. They need help. Even if they are angry, they will be alive. They don’t have to manage their depression by themselves and neither do you!